Ronan Lee is an Irish-Australian political advisor and PhD candidate at Deakin University researching Rohingya history and identity. Ronan’s professional background is in politics. He was formerly a Queensland State Member of Parliament and Parliamentary Secretary and has worked as a policy and campaigns advisor. Ronan has travelled extensively in Myanmar, first visiting the country to witness the political changes associated with its transition from direct military rule to a quasi-civilian government. He witnessed Myanmar’s 2010 general election and met with opposition leader Aung San Suu Kyi shortly after her release from house arrest. Ronan has provided comment for the BBC, Al Jazeera, TIME, and the Guardian and has written widely about Myanmar including for Australian Fairfax publications, Myanmar Times, The Conversation, Malaysia’s New Straits Times. Growing up in Ballyjamesduff, County Cavan, Ireland, Ronan was educated at St Patrick’s College, Cavan and St Columban’s College, Brisbane. He has a Bachelor of Arts from the University of Queensland and a Master of International Relations from Monash University. Ronan’s Master’s thesis was titled ‘A Politician, Not an Icon. Aung San Suu Kyi’s silence on Myanmar’s Muslim Rohingya’. In 2001 Ronan was elected to Queensland’s State Parliament and served three terms as Member for Indooroopilly where he focused on delivering better public transport and stronger protections for the environment and wilderness places. 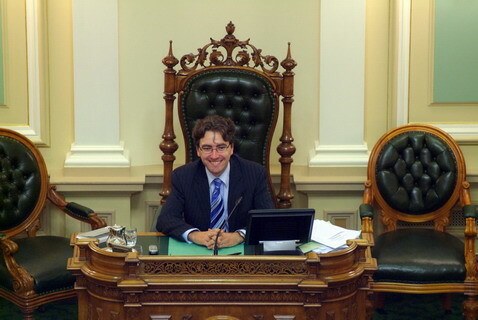 As MP for Indooroopilly, Ronan was a Queensland Parliamentary Temporary Speaker/Deputy Speaker (2005-2006), Chair of a Budget Estimates Committee (2006) and Parliamentary Secretary to the Minister for Communities, Disability Services, Aboriginal and Torres Strait Islander Partnerships, Seniors and Youth (2006-2007), Parliamentary Secretary to the Minister for Main Roads and Local Government (2007-2008), and Parliamentary Secretary to the Attorney-General, Minister for Justice and Minister Assisting the Premier in Western Queensland (2008). A member of The Wilderness Society Ronan was a vocal advocate for many environmental issues, including protecting Queensland’s wild rivers, ending broad scale tree clearing and banning duck shooting. Passionate about protecting Cape York for future generations and wanting to see Tassie’s wilderness and high conservation value places protected, he left the Queensland Labor Government in 2008 because of their policy inaction on tackling climate change, failures on important environmental policies like promotion of the renewable energy sector, failure to protect wilderness rivers and failing develop a better public transport system. Ronan became Queensland’s first MP to be a member of the Greens. At the 2009 Queensland election Ronan didn’t retain his seat as a Green but achieved the Queensland Greens highest ever vote at a State Election of 25.93% and the Queensland Greens highest ever state-wide vote of 8.4%. As Convenor of the Tasmanian Greens Publicity Committee for the successful 2010 Tasmanian State Election, Ronan co-ordinated the campaign’s TV, radio, print, cinema and internet advertising as well as the production of quick response leaflets during the campaign. At this election the Tasmanian Greens achieved a record high vote of 22%, the balance of power in the Tasmanian Parliament and regained a seat in Braddon for the first time in over a decade. The Green’s achieved a Government Ministry for the first time in Australia and Ronan became the initial Head of Office for Minister Nick McKim, establishing the Ministerial Office of the Minister for Human Services, Minister for Corrections and Consumer Protection, Minister for Community Development, Minister for Climate Change, Minister for Sustainable Transport and Alternative Energy.